Made using cider & apple. Succulent British pork made to a West Country cider recipe.We know you value tradition, and when it comes to a truly tasty British favourite we know you want the best. 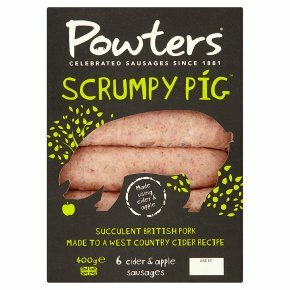 Our artisan sausages are prepared in small batches and made with prime pork from British pigs. These sausages are bursting with a flavoursome tang that's straight from an English orchard. The sweet and zesty apple nutmeg is enhanced with a blend of sage, marjoram, nutmeg and pepper. Scrumptious!